Buy anew versionof this Connected Casebook and receiveaccessto theonline e-book,practice questionsfrom your favorite study aids, and anoutline toolon CasebookConnect, the all in one learning solution for law school students. CasebookConnect offers you what you need most to be successful in your law school classes – portability, meaningful feedback, and greater efficiency. 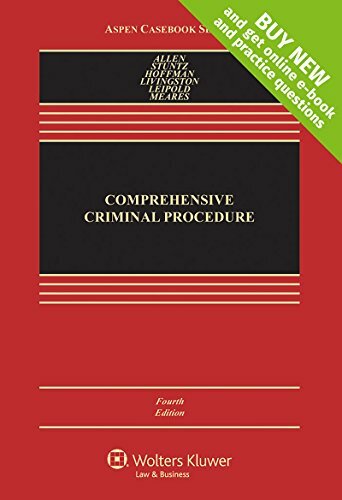 Comprehensive Criminal Procedureis a casebook for all introductory courses in criminal procedure law (including both investigation and adjudication courses, as well as comprehensive and survey courses). The casebook focuses primarily on constitutional criminal procedure law, but also covers relevant statutes and court rules. The casebook is deliberately challenging—it is designed for teachers who want to explore deeply not only the contemporary state of the law, but also its historical and theoretical foundations. The casebook incorporates a particular emphasis on empirical knowledge about the real-world impacts of law-in-action; the significance of race and class; the close relationship between criminal procedure law and substantive criminal law; the cold reality that hard choices sometimes must be made in a world of limited criminal justice resources; and, finally, the recognition that criminal procedure law always should strive to achieve both fairness to the accused and justice for society as a whole. We have added a wonderful new co-author, Yale Professor TraceyMeares, whose special expertise in the law and policy of police investigations has enriched the casebook tremendously. The Introduction chapter has been updated with a number of new scholarly writings that provide an overview of important aspects of criminal procedure law. The Right to Counsel chapter incorporates the new wave of structural reform litigation over the often-crushing caseloads and frequently inadequate resources of public defender offices; the chapter has also been completely reorganized for clarity and ease of teaching. All chapters in the casebook have been updated wherever necessary, and all have been re-edited and streamlined to improve theirteachability. Quiz yourself before class and prep for your exam in the Study Center. Practice questions fromExamples & Explanations,Emanuel Law Outlines,Emanuel Law in a Flashflashcards, and other best-selling study aid series help you study for exams while tracking your strengths and weaknesses to help optimize your study time.